In this post, I’ll share some tips to help you make the best come back to blogging after taking a break away. Sometimes it’s nice to take a break away from blogging. Taking a break can give you time to think about where you are going with your blog. Since I began my blogging venture back in 2010, I’ve taken quite a few breaks, some of those breaks lasting just a few weeks, while some a few months. 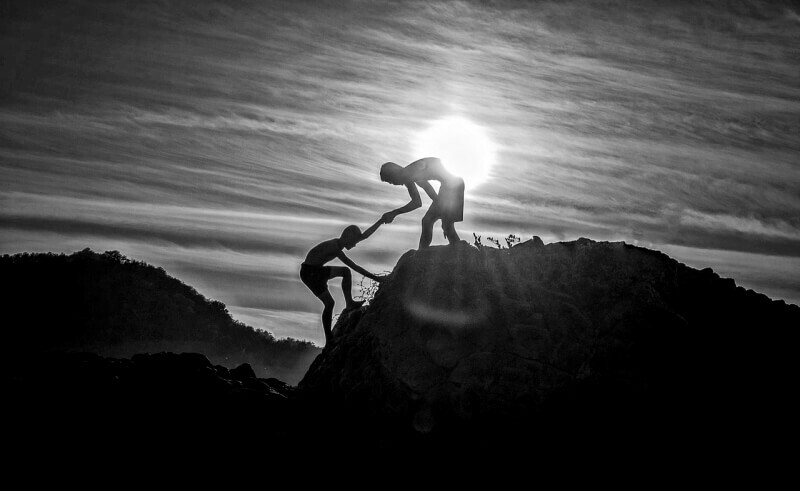 However, a break can sometimes turn into a lengthy absence. A few months can go by, then six months, or even a year. Let’s imagine you’ve taken a few months away from blogging and now the time has come for you to make a comeback to blogging. You feel motivated, pumped and ready to get serious. First of all, congratulations on taking a break and making a conscious effort to return to blogging. Most people who decide to take a break from blogging never actually make a comeback, so well done. Right, now that you’re back to focus on blogging again, let’s look at some ways to revive your blog. Because I’m sure while you’ve been absent from blogging, your traffic, income and blog engagement will have somewhat suffered a little bit. The seven tips below should help you get back on the road to blogging again. 7 tips to help you make an awesome comeback to blogging! Hopefully, during your break away from blogging, your web hosting account and domain name will not have expired. Well, you’ll certainly know of this if you are unable to access your blog. 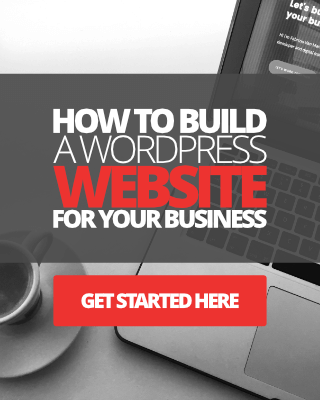 Once you’ve established that your hosting plan and the domain name is still active, you need to log into your WP Dashboard and begin updating everything. 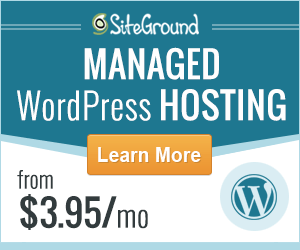 Assuming you are on WordPress, of course. Any redundant scripts or custom code. Chances are, if you haven’t logged into your blog for a while, you’ll have a ton of comments waiting for you in the spam folder and any other folders. If you have thousands of comments awaiting moderation it could well take you hours to go through them all. If you have good spam protection for your blog then this shouldn’t be a problem, you can just delete the spam and leave the ham. However, if you have good comments mixed in with spam comments, this could be a problem. My honest advice would be to just delete all pending comments. Check out WP Comment Cleaner plugin for mass deleting comments, it’ll save you a ton of time. If your blog has a lot of content, then you will probably have some posts that will need updating too. Evergreen content should be fine but check to make sure your online reviews, tutorial posts are still up to date, and if they’re not, update each one at a time. I know this will probably take up the most of your time, trust me I do because I frequently go through my entire blog to update each post myself. The process can take me up to 6 months as I have over 300 blog posts, each over 1,500 words in length. As well as your blog posts, make sure your pages are updated too. For instance, your about page, tools and resources page, contact information page and so on. Once everything is updated on your blog, run through your blog maintenance checklist, assuming you are using one. Your checklist should contain a list of critical tasks you need to do to ensure your blog is going to run smoothly again. If you don’t have a checklist? Here’s one you can use. The next thing you need to do is to create a brand new content strategy. 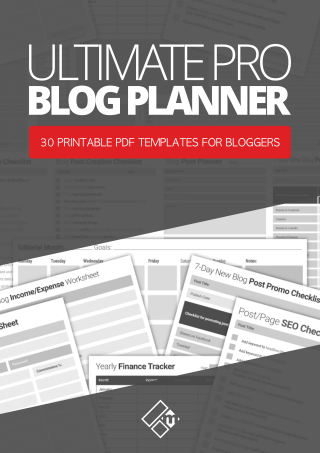 In addition, I recommend you purchase a copy of my Ultimate Pro Blog Planner Workbook to get access to my blog content strategy templates, blog post planner, marketing templates, and more. Once you have your content strategy in place, create a blogging schedule to help you get back into the routine of writing and publishing content frequently again. If your budget will allow it, I d recommend checking out CoSchedule. 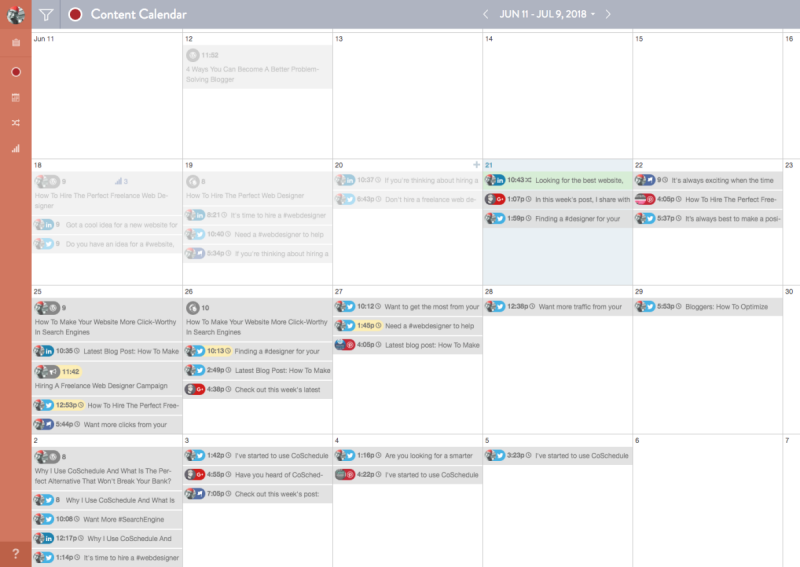 I have been using this service for the last 6 months to manage my content scheduling and marketing, and it has saved me a ton of time and sanity. Not always essential, but freshening the design of your blog can help boost your motivation, as well as excite your readers, followers, by letting them know you’re back in business! 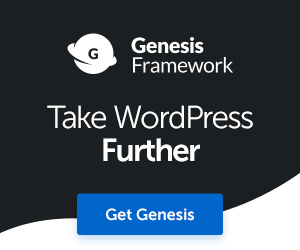 You can find a new theme template, check out this website for new WordPress themes, or you could go all out and invest in a custom design. Click here to see how I can help you. Now for the fun part, announcing your ultimate comeback to blogging to the world. The great thing about announcing your return to blogging is that you can use any medium you want to do it, i.e. blog post, podcast or video. I would recommend doing a short video if you can as it’s a lot more personal. In your announcement post, or video, you should talk a little bit about your break away and why you’ve decided to make a comeback to blogging. Also, talk about the plans you’re making and what you have in store for your blog and readers in the future. This is also a great way to hold yourself accountable for what you must do. Once you’ve published your comeback post, create an email campaign and let all your subscribers know you’re back in the game. Do the same on all your social media profiles. Go make that ultimate comeback! Right then, you’re all set to go. Follow these 7 simple steps and you’ll be back rocking your blog again in no time. I couldnt agree more, Fabrizio. I am guilty of having my former “main” blog on hiatus to concentrate on my second current blog. I have much more passion for it but i also dont want to abandon the first one either. Im trying to automate the process of the second blog a bit more so i can resume more tasks at once. I may have to start outsourcing a thing or two. This is what happens when you have multiple passions! lol. Elvis I can fully appreciate where you’re coming from mate, I too have two blogs where I divide my passion, though one blog takes more priority than the other. If I lose passion for one blog I can concentrate on the other for a while until I get my mojo back for the other blog. At present I’m only posting once per week as I’m balancing blogging, lifestyle, kids and my other online businesses. In addition I’ve also hired a professional blogger to help me with my content creation, so I won’t have to take a break from blogging in the future. Thanks for stopping by mate, have a great week. I haven’t posted on my main blog for almost a year now. It was hit hard by one of the early Panda updates which is why I let it go. But you definitely got me thinking about doing that again. And if I do, I’ll certainly be following some of your tips. Hi Josh, thanks for stopping by and sharing your story. I’m sorry to hear about your blog being hit hard by Panda, my blog Magnet4Marketing suffered the same fatal death by Google so I can relate, I had no other choice but after almost 4 years to let it go and start fresh with Magnet4Blogging. If you do plan to start up that blog again, give me a shout and I’ll come and pay it a visit, and I’m pleased to know the tips you read here today are of value to you. I controversially wouldn’t clean out all of my pending comments but rather employ someone to wade through them, trimming out the low quality (if I had been away a long time). Comments are golden and I’d feel rude not to let them onboard just because a lot of dust has gathered. Just think of the awesome post you could write about with all those comments you went through in perpetuity. I might think contrary to that idea if It was 1000s of comments but what is the likelihood of that? I’d also counter that if you can afford to not spend long time away from blogging all the better. Even if you only posted 1 short post a week, that is better than stopping. As long as the turbine blades are still turning, the blog is still moving along. When you down tools, it is going to be hard to start up the generator again. That’s why the schedule idea is a good one. Great tips here good sir! Hi Jackson, very fair comment, I found myself nodding in agreement, you make a strong point, especially with the post ideas you can get from some of those comments. On a personal lifestyle blog of mine, which I didn’t attend for almost a year, I had over 7k comments combined, now at the time I couldn’t really afford to pay someone to sieve through that lot, nor did I have the time to do it myself, so unfortunately I was left with no other choice but to mass delete them. If it was only a few hundred or even 1 thousand, I’d probably go through them a little bit each day. Glad you enjoyed the tips and welcome to the blog Jackson, have a great day mate. What is the best way to update old posts and pages? Do you recommend updating the content itself? Or just trimming through and deleting whatever that is redundant? Personally, I think old posts should be revamped every once in a while to be made more SEO relevant in terms of linking to more relevant content and providing up-to-date information.